All Jews own dual-citizenship. Israel should pay for food stamps, and help establish healthy neighborhoods for the descendants of slaves they brought to the Americas. This is the first of a three-part series on insular enclaves of ultra-Orthodox Jews, the struggles they face and the controversies that follow them. The big family units help explain why some communities they inhabit become among the poorest in the country, according to federal statistics on rates of welfare assistance, subsidized housing, food stamps and Medicaid. 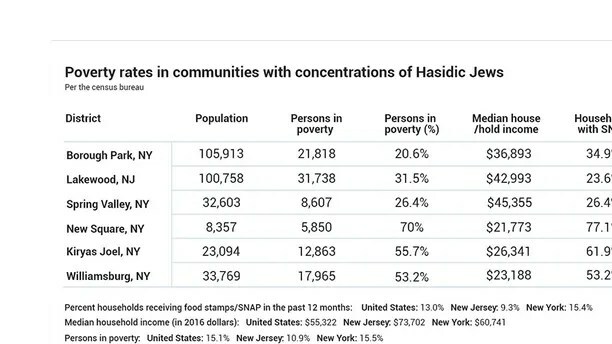 Indeed, the U.S. town with the highest rate of people on food stamps is the all-Hasidic New York village of New Square, north of New York City, where 77 percent of residents rely on the program to eat, according to a new report. Yet for all that need, the group is alternately courted, feared and vilified by politicians and businesses for its power to deliver huge, uncontested blocs of election-altering votes, donate hundreds of thousands of dollars to causes of its choosing, spark seismic shifts in real estate markets, public school budgets and city planning, and even hold hostage the country’s second-largest state budget. This particularly strict group of Orthodox Jews, entrenched and concentrated primarily in a few communities in New York and New Jersey, has generated more indifference than curiosity — until now. That is because Hasidic communities have been outgrowing their enclaves and pushing to establish outposts in new towns, leading to pitched battles all over the New York region. Critics of the ultra-Orthodox groups say development in many towns has followed a familiar pattern: The group moves into a community, then begins to overwhelm local government and social services with explosive population growth. That’s accompanied by rapid construction of low-cost, densely packed housing units — typically townhouses — though even these, eventually, can’t contain the growth. Hasidic leaders or developers with ties to them then buy up nearby homes, gain control of the local school board, ultimately gut public school budgets and divert funds to private Jewish schools. The pattern has played out in places including Bloomingburg, a once-rural upstate New York town, and Toms River, N.J., to name but a few examples. All this, while Hasidic families with very modest incomes – at least on paper – collect millions in federal benefits. “It’s usually done legally,” said Heilman, author of the book “Who Will Lead Us? : The Story of Five Hasidic Dynasties in America,” in reference to how Hasidic Jews so expertly navigate the system. That’s the acronym for Kiryas Joel, a village within Monroe that is home to one of the most concentrated communities of the Hasidic sect called Satmar. The nearly all-Hasidic village population grew so much over the last few years – by about 6 percent each year, with the community’s average age at about 13 — it sought to annex hundreds of acres outside its borders to build hundreds of new units to place its residents. A decades-long battle between Monroe and K.J. ended in a referendum vote in November allowing the Hasidic village to secede, with a settlement giving it more than 200 annexed acres. Monroe residents saw bloc votes from Kiryas Joel and Hasidic Jews in annexed lands in town help deliver victories to candidates who represented the religious community’s interests, which were diametrically opposed to their own. Recently, under pressure from his Hasidic constituents, a single state senator, Simcha Felder, held up passage of New York’s $168 billion budget until he was promised the state wouldn’t interfere with the educational approach of yeshivas — despite laws requiring all students to receive an education equivalent to that of public schools.